Hello Everyone, Now, Your PC/Laptop will be turned off automatically after a specific time. 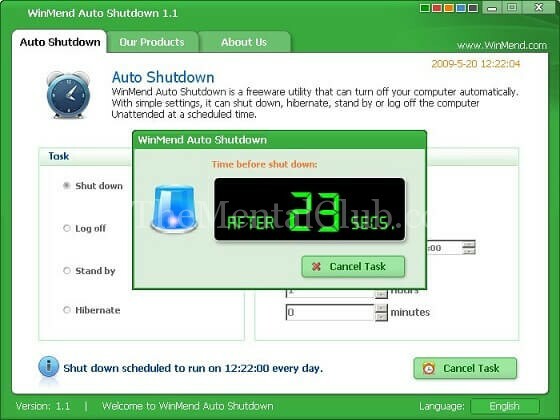 Now, you can shut down your computer automatically by WinMend’s Auto Shutdown software. WinMend’s Auto Shutdown is a free software for Windows platform that can turn off your computer/laptop automatically. With simple settings, it can shut down, hibernate, standby or log off the computer unattended at a scheduled time. A related article you can read, How to show hibernate option in Windows 8. Alternatively, you can read, How to shut down a computer automatically after a specific time. Yes, you can turn off your PC by using a timer. The timer means time setting. If you want to shut down your computer after 30 seconds or 5 minutes or 10 minutes, then it will turn off after 30 seconds or 5 minutes or 10 minutes. If you want to turn off your PC after 1 hour, then it will turn off after 1 hour. You have no need to follow more steps. Now, you have to download a software to shut down your PC after a specific time.